After a handful of recent posts about E.T. memories from my childhood, Shawn from Branded in the 80's continued with the topic by talking about a few memories of his own. One of his posts was about the sequel book to the E.T. story we're all familiar with. 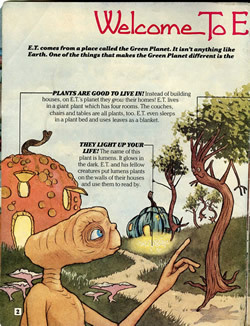 The Book of the Green Planet follows E.T. as he leaves Earth and returns to his home planet. Intrigued by Sean's post, I was happy to find that my local library had a copy of this book and, during what little spare time I've had over the past week, I've been reading about life on the Green Planet. E.T. 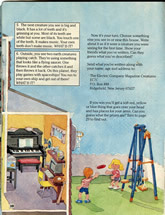 's peers include a variety of creatures such as Jumpums, the Flopglopple, and Micro Techs. As with any book, the reader is left to create an image in his own mind of what these characters look like. But this weekend, in a completely random and coincidental stroke of luck, I came across a magazine that gave me a much more detailed perspective of these Green Planet inhabitants. For 50 cents at a local flea market, I came home with a (beat up) copy of the July 1985 issue of The Electric Company Magazine. When I bought it, the magazine was wrapped and sealed in plastic so I picked it up based on the cover alone. For 50 cents, I figured it was worth a gamble. Getting it home, I was pleasantly surprised by the contents as this issue was published at almost the exact same time as The Book of the Green Planet. 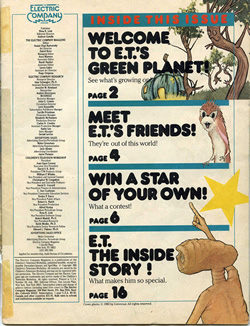 The first feature in this issue is titled "Welcome to E.T. 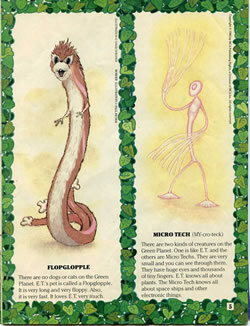 's Green Planet" and introduces readers to the other creatures that live on E.T. 's home planet -- the same creatures I had been reading about off and on for the past week. It shows E.T. 's gourd-like home as well as the Jumpums, fluteroots, timpanums, and trompayds. 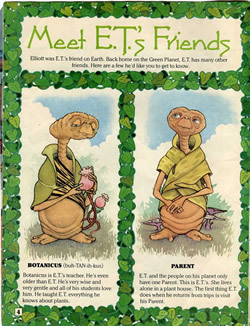 The next page goes on to describe E.T's mentor Botanicus, his Parent, the Flopglopple, and a Micro Tech. For the record, the Flopglopple looks a little bit like what I had imagined but it's safe to say I was way off with the Mirco Tech. 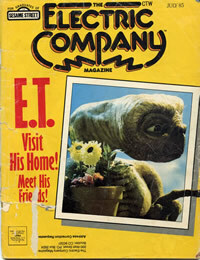 A large majority of this magazine is dedicated to E.T. as can be seen from the table of contents page below to the right. 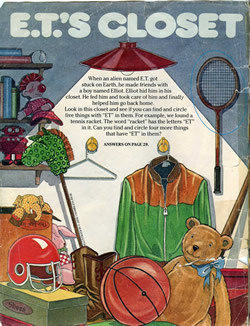 Even the inside cover jumps right in with a word activity called "E.T. 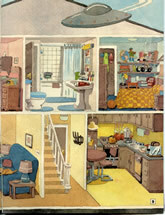 's Closet." Readers were offered the opportunity to enter a contest to have a star named after them but I was more interested in the one-page Spiderplant comic. 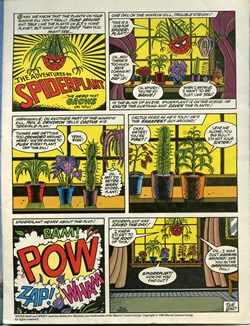 Spiderplant is the "hero that grows on you" and is based on the following premise: "We know that the plants on your window sill don't really jump around and talk like the plants on E.T. 's home planet, but what if they did? Then you might see Spiderplant!" This comic is done very much tongue-in-cheek and is a great addition to the theme of this issue. 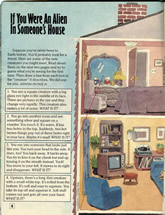 A three-page spread called "If You Were an Alien in Someone's House" gives readers the chance to guess what everyday household items are being described as though they are foreign objects to someone new to Earth. 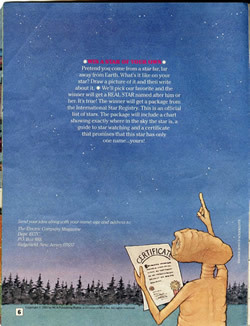 The centerfold (for lack of a better term), is a picture of E.T. 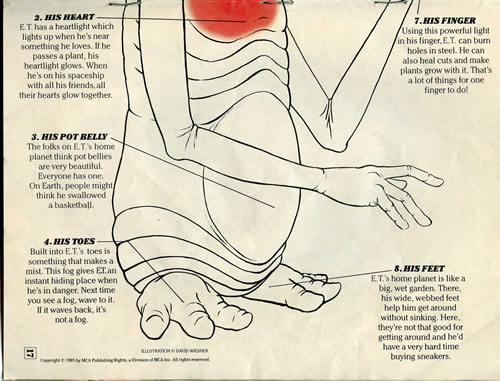 with his varous powers and assets labeled -- everything from his glowing finger to his pot belly. Aside from all of the cool pictures in this issue, one page really stuck out to me. 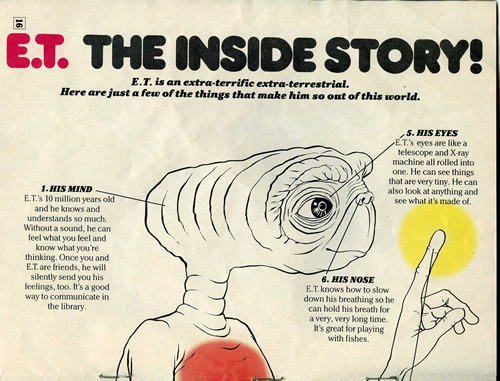 The left side of this page mentions to readers that they can learn what happened to E.T. after he left Earth in the "new book E.T. The Book of the Green Planet." Although noteable, it was acutally the other half of this page that caught my eye even more. 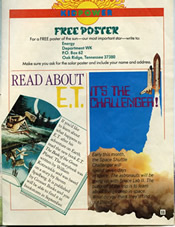 With a shot of the Space Shuttle Challenger, the text describes how the Challenger will be spending seven days in space "early this month." The mission being referenced actually began on July 29, 1985 and was followed by another mission the following October. Sadly, as anyone old enough remember certainly does, these were the final successful missions for the Challenger. Quite honestly, this issue of Electric Company Magazine is lucky to still be around. With a torn cover, my mom would have tossed this one in the trash upon sight. But I'm thankful for whatever reason this magazine has survived the test of time as I can now finish The Book of the Green Planet with a clearer picture of the characters involved. 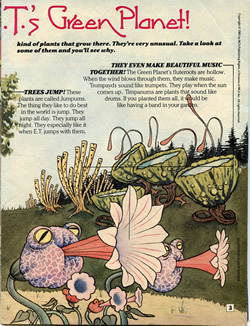 Hey, great find on the magazine, and thanks for offering the PDF - I'm a sucker for anything E.T.. My version of The Book of the Green Planet is a fairly old copy and it has a nice cover image which features a Micro Tech strumming a harp. I don't think I've seen any of the other creatures before though. Also, how about making each image so we can click through to larger versions. There's some great photos/scans in your posts and I'd like to see bigger versions. Cheers. Jephso -- Glad you enjoyed this! I'll try to find some time to add larger images. In the meantime, the pdf version should show you the detail you're looking for. I realize this post is now five years old, but if you still have the PDF version of that magazine, I'd be interested in getting it. :-) It's hard find to material related to the Expanded Universe of E.T.! Drop me an email through the "About" page and I'll see if I can dig up this file.